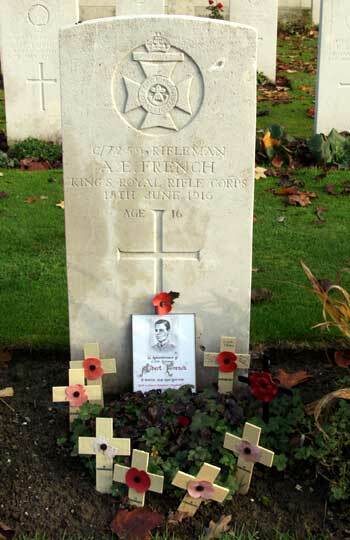 Albert French was allowed to enlist after lying about his age so that he could “do his bit”. He was killed at Ploegsteert (“Plug Street”) in Belgium, south of Ieper (Ypres) when he was still just 16. His story was uncovered and published by The Living Archive, which is based in Wolverton, Albert’s home town: one result of this is that Wolverton is now twinned with Ploegsteert. 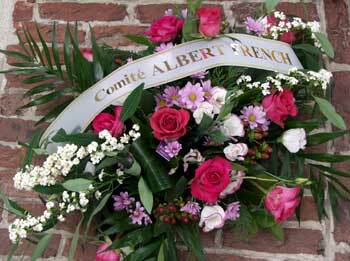 As a result of a successful campaign to get Albert’s age added to his headstone (see above – photographed on 11th November 2004), his grave is now one of those featured on tours of the Western front, and his story commands a paragraph in the latest edition of Major and Mrs Holt’s Battlefield Guide:The Western Front – North.